Now I know how Laura was feeling that day! I've gotten hardly any running in these last two weeks. And the result is: grumpiness, depression-like symptoms (especially earlier this week... awful! ), and mid-section fluffiness... This morning, while still all warm in bed, I was like "As soon as I get up I am going to run like 20 miles to make up for all of this laziness, get my blood flowing again..." etc. It didn't happen (I don't think my legs could do it at this point), of course, but I did get out there. I may not have gone at all, but I decided to use my dog, Luna, as the perfect excuse to both run, and go less far. We went on her favorite 3-miler. I wore my Vibram 5 fingers and almost had the experience of feeling other peoples' dog poop squish between my toes about 5 times! Ewwww. The shoes themselves feel great, especially going up hills because they're so light. I guess that until I feel like running for running's sake, I'm going to have to do it this way: make it about something else. Commuting on foot is another way to fool myself into running (a lot of my running over the last few weeks has been to go to appointments and meetings). Man, I need to get the endorphins rolling again. Advice? I just got back from doing some hill work with my new Vibram 5-fingers, which are really growing on me. I've only used them a couple of times because of a cold spell which hit a couple of weeks ago, but now the weather has warmed up again and so I got them out. I think they're great for people suffering from shin splints. It's refreshing to feel like you're using muscles (like your shins) that you don't use much with regular shoes. While I was out there, I was thinking about how my life has changed over the last few months (except for my uncertain work situation, it has all been positive). Here are some of the small changes I've made that are making a big impact on my life. 2. I'm using the car as little as possible. If I don't have to be clean and fresh when I arrive, I run, otherwise I take the bus. Impact: Alot of my running miles are simply transportation. I feel so green! I don't have to make time for running-- it's built into my day. 3. I stopped drinking about 3 weeks or so ago. Before, I would have a glass (bottle) of wine with dinner with Sweety and (often) drink too much when we went out with friends. I decided that it was counter-productive to all the healthy lifestyle choices I was making, and, let's face it, at my age, you get killer hangovers. I did have a couple of drinks when my friend Daniel was here from Brazil one night, but the nice thing was that it felt like an exception, not a rule. Impact: I don't miss it. I feel clear-headed, I can concentrate better, I wake up earlier, and am still really fun. I drink tea instead, or hot water and lemon, and this keeps me happy and hydrated (even if it makes me sound boring). Interestingly, my friends have not really noticed. 4. I run more often but less miles. Even when I log 7 or 8 miles, chances are it was broken up into 1.5-3 mile chunks. This really agrees with me. I feel strong and a bunch of my pre-marathon pants fit again. 5. I'm watching as little TV as possible and reading. This is positive in every way possible. Kilo count: I'm down 5 kilos from my high in July. Trying to keep it steady and get down to my goal of losing another 9 or so kilos (or about 20 pounds). Since we started our challenge I have lost 2 kilos. 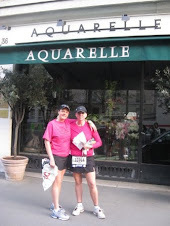 About a year ago, Kari and I had already decided to run the Paris Marathon and we had established that we wanted to do just a bit more than run the marathon. We were committed to raising awareness for Rotary International's efforts to eradicate Polio around the world. Kari and I were Rotary Exchange students to Belgium (nearly 20 years ago) and decided that it was time for us to give back to the organization that gave us so much during our year overseas. As we trained for the marathon, we looked for ways, creative ways, to raise money for this very worthwhile cause. In the end, we figure that we raised somewhere around $20,000 toward Rotary International's PolioPlus Foundation. In truth, there is no way to place a figure on the amount of money we raised, but we can track the majority of it through my local district, who matched our amount. Beyond that, the Bill and Melinda Gates Foundation agreed to match Rotary International's global efforts as well. SO - for every dollar that we raised, PolioPlus recieved $4.00 - that's a great return on an investment! So, when I discovered that today is world Polio Day, I wanted to share the effort that Kari and I are most proud of - THANK YOU for your support, monetary and otherwise. Please watch this short video to find out more about Rotary International's efforts to eradicate Polio. So, my sister in law sends me this link and said "read this and thought of you"
Have a read and enjoy - I know I did. 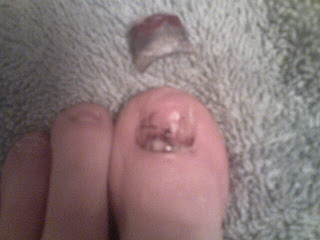 By the way, I have pulled off three toenails in the last week and my feet feel better for it. 3 - despite my attempts to drop my jkl challenge 15 - it's just not coming off. In spite of a couple of relapses (wine yesterday, chocolate today) I am feeling great! I'm getting a lot of miles in becase I'm running to work as much as possible, and the fact that I'm doing shorter distances means that I actually look forward to running because I know that I will be done in about 30-45 minutes (rather than, say, 3 or 4 hours...). I sometimes double up so I can get 60 minutes in a day. This recipe seems to work for me. Since we started our challenge I have lost about 2-3 kilos (depends on when you ask me: morning, afternoon, before run, or after...) and am pretty committed to staying on track. The other nice thing about the 30-45 minute run is that I have not fallen prey to the FLU (Poor Sweetie has...). Studies show that if you run more than 45 minutes, you lose that protection (although the natural anti-inflammatories kick in at that point, which can be helpful for the long runs. Check this out. I think it's old news for a lot of runners, but whatever). This makes me think of Laura's rip-roaring colds that she got before BOTH marathons. Hmmm. Maybe peppering the marathon training with short runs could help? Anyway, waiting for an update from the other challenge participants. Although, Ms. Fool seems to have an unfair advantage because, although she has a weakness for red velvet cupcakes, she is at the tail end of her NY marathon prep and getting in some seriously long runs (and placed 3rd in her last 10K!!)! Laura, give us an update, girl! I decided to take a walk with my VFFs today (and my dog). I spent most of the time stretching out my toes to try to get used to what the Vibram people call the "Toe Pockets". It helped. The pinky toe on my right foot is feeling more comfortable. I have them on as I write this. They don't feel invisible yet but I think we're getting close. I am going to run in my regular running shoes today, just because I don't want to overdo it. I'm going with Michael's advice to take it slow. I just did two 1.5 mile loops in my new Vibram 5 fingers. You don't have to dig around for clean socks. They feel like you're running barefoot in all the good ways. They force you to use your whole body, including the upper legs. The slapping sound on the pavement makes you realize how bad your form is (I'm working on it). It's a great workout for the shins (especially for those of us with shin splints which are not stress fractures). They look much less weird to passers-by than going barefoot barefoot. They have good grip on slippery surfaces and wet areas. They will be GREAT for travelling since they take up about a third the space of regular running shoes. They're not easy to put on, but generally, if you get your first and second toes in, the others follow suit. They are one width fits all, and I have narrow feet, so my pinky toe is spread a little too far. Rubbing of material on said pinky toe. Like I said in a previous post, they are not the perfect fit, but they seem to be okay anyway. They are kind of like a ballet slipper, they come up to just where your toes turn into foot, which is a bit like putting on one of those footies at the shoe store. It feels like it should come up higher. They have a drawstring that I initially had pulled tight, but when I loosened it, it was much better. It would be hard for them to fall off with your toes wedged into the toe holes anyway. All in all, I like them. I did not run far, but I did expect to have something to show for it, like blisters or sore spots. I don't. I would like to plunge right into using these and putting my regular shoes away for a while, but promised myself that I would ease into them if I feel any kind of discomfort at all. This is going to sound strange, but running down the street in them brought back memories of running on a beach somewhere. I know, but the sensation is similar. You have direct contact with what is under you (even through the rubber) and the absence of cushion forces you to use your entire body as a shock absorber, which is one of the reasons, I think, that running barefoot is so satisfying. When you finish your run, you have the feeling that your whole body was part of the running process, from your feet up to your shoulders. So far, so good. Once my pinky toe toughens up, the VFFs are going to be awesome! The other day I was taking a walk with Sweetie downtown by the Piazza where there were stands and lots of people walking through them for the Barcolana Regatta slash stuff-that-has-nothing-to-do-with-sailing Expo when I ran across a display for (you're never going to guess what, Okay, I'll tell you) VIBRAM 5-Fingers. I couldn't believe it. I thought I would never see them in Europe, but there they were. So I tried them on (the 40s were too snug, the 41s, a little loose) and quickly bought them (on sale) without really thinking it through (they are yellow and denim-colored). I was feeling pretty smug about the GREAT DEAL I got when I passed ANOTHER DISPLAY of VFFs where they cost 8 euros less. Then I sort of regretted rushing into the purchase. But oh well. Now I have them on my feet and I think they look silly and feel funny. Will I get used to them? I'm thinking of a doing a run around the block to see how they work. I'll let you know how it goes. According to the Daily Mile, today I hit 900 miles for the year. Happy 900 to me!! I should get something for this, like, I don't know, a bozo button, or a cookie, or a quarter to call someone who cares, or something, right? I can't wait to hit 1000. Then I'm going to party. I am feeling great these days. I officially went free-lance a couple of months ago and I'm actually working (getting paid is another story...). I'm finally doing work that I am good at again (I'm officially a Translator/Interpreter but I do other things like teach, help out at the Italian American Association here in Trieste, help people when they get in a bind with Social Security in America, you name it, if it's in English, or has to do with America, I can help. ), I'm seeing and meeting lots of interesting people, and have been about 1000 times more productive than I had been in a long time. I wake up at least an hour earlier than I used to when I had to get up and go to work and I sleep like a log! Working in my little office at home rocks. I love it. The other great thing is that since I determine my schedule I can fit my runs in during the day. I can run to meetings and appointments and/or home if Sweetie gives me a ride there. This is the coolest. It's exactly the kind of lifestyle I have always wanted for myself. Yeah! If you don't have days where you just think I HAVE THE COOLEST LIFE. Rethink something, please, and take action. Can we NOT plan fun things during this challenge? This whole challenge thing would be MUCH easier if people didn't get married during them or plan really fun things to do that involve eating during the period of time we have set aside to be GOOD! I've been trying to put more miles on, as my dailymile log shamelessly boasts, which was good for taking off 4 kilos. I put a couple back on over the weekend, but am working on that, too. I thought cutting out booze alone would be good for some automatic weight loss, but sadly, that is not the case. What it has done, however, is make for some amazingly lucid mornings, and that is a good thing. This morning I did all my errands by running. I was really happy that the dentist was not grossed out when I put my microfiber towel under my head so as to not get his fancy dentist chair all sweaty... He actually said I was BRAVA just for running. That made me feel pretty good. I will write more later. Am on my way out the door!!! See you after lunch. Some of my friends and I are planning on heading to Europe in July to catch some of the Tour de France when it departs Holland and heads through Belgium on its way to France. I know it is early to start writing about it, but my friend, Beckster, and I are really starting to get excited about it. (Kari- you going to come up and join us in Liege for a few days? ) Beck has found some tools on the Livestrong website to help get her on track for our trip. She and I are cycling junkies - truly need intervention in the month of July - and can't wait to watch the tour through the flat stages in the summer. Maybe I'll take a look at Lance's tips for healthy living - both Beck and I want to be strong for our trip. I think she is secretly joining our JKL challenge. I was so happy to hop on the scale and find myself down three lbs - YAY me! Those south beach breakfast bars and yummy lunch salads paid off. Too bad that I stepped back on a few days later to find myself right back where I started! BOOO me! Well, the long and the short of it is that I fell 5 miles short of my weekly goal (not killing myself about this, though.) I practiced serious control yesterday at the famly Oktoberfest - only had one beer (but made it a good one, of course.) I wish I could have stayed away from those RiceCrispie treats, though. All-in-all, not a bad first week. I need to start looking for some half marathons in the area - MUST FIND A GOAL to keep me living strong! We are running, are they reading?